Parrott served the foundry well during the next 41 years. He became the lessee and operator of the foundry and experimented with the manufacturing of artillery. As a private citizen Parrott was able to experiment with cannons and projectiles without the usual red tape involved in government foundries. His accomplishments during his tenure included the perfection of a rifled cannon and its corresponding projectile (both named after him) patented in 1861, and the Parrott sight and fuze which were developed during the Civil War years. 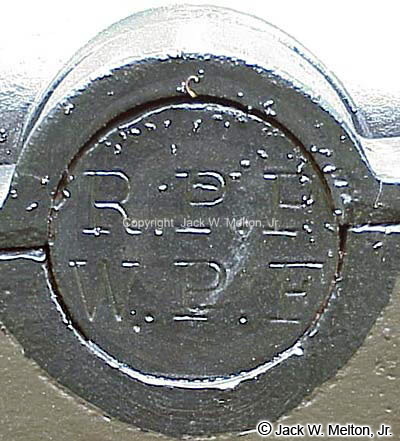 The fact that his foundry was used to manufacture his weapons is proved by the letters WPF (West Point Foundry) found on the Parrott gun tube, along with his initials RPP. Parrott's cannons were distinguished by a single reinforcing band around the breech of the cast-iron tube. His first rifled cannon design, a 10-pounder, was turned out in 1860 and later patented in 1861. By the next year he had developed the 20- and 30-pounder versions. To see a list of Parrott projectiles click here. Parrott's patents # 33,099 and 33,100 are his first projectile patents. In 1867, Parrott turned the operation of the foundry over to other parties, but he continued to experiment with projectiles and fuzes until his death on December 24, 1877. A September 7, 1861 issue of Scientific American has some information about Parrott worth reading. Read the politics of Admiral Dahlgren after Parrott offered four 300-pounders for the Charleston Siege in the August 1, 1863 issue of Scientific American. January 14, 1865 issues of Scientific American. Page 32. Page 33. Robert Parker Parrott's Birth Record from his Family. Read Parrott's Obituary for additional information. I have had the honour to receive your letter of the 18th inst. with the copy of a communication from Major A. B. Dyer of the 28th October last, which he requests may be sent to me that I may correct, if erroneous, some statements made in relation to the "Parrott projectile". Major Dyer apparently conceives that the plan of casting soft metal in the body of a projectile originated with him; he having proposed it to the Ordnance Department in the spring of 1859, and having actually made and tried such projectiles. He also says "I stated at the time that I would use" "bronze in all guns larger than field guns &c."
The distinction here made between "soft metals" and "bronze" is a correct one, founded on the physical properties of metals and alloys, and the general understanding in regard to them. Thus, in the Ordnance Manual the directions are given for casting on the "soft metal" on Rifled projectiles, entirely inapplicable to bronze. In reference to the claim of first proposing to cast a soft metal base on the body of a projectile, I enclose herewith the section of a projectile actually made and tried by me, to the order of another party in 1856. We succeeded about as well as the other attempts made at the same time; in some of them in that year Copper was used. 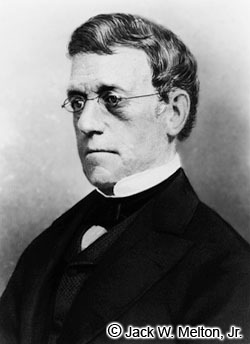 Major Dyer can hardly be aware of the multitude of attempts to extend the expansion principle to cannon as soon as it had succeeded in small arms. I should not envy him the task of maintaining the imaginary patent with which he thinks proper to invest his claim to have first suggested not only the casting of soft metal, but "ferro bronze" and all other metals and alloys capable of being cast on the body of a projectile. I am willing to leave whatever I have done to be judged by its merits; and, though I have not pressed claims for orders or for compensation based in rights of innovation only, I believe I have brought into practical use valuable principles of Rifled Ordnance; and that my projectile can be identified by features which mark it as eminently original. It is quite distinct from the Read [invented by Dr. John B. Read] projectile and is sustained by a patent of its own which was granted to me without question. The Read projectile was brought to me by the inventor in 1856; encouraged by a somewhat favourable report of a trial made by Major Dyer at Fort Monroe and his reccommendation [sic] to the Chief of Ordnance that further trials should be made. I purchased for this Foundry from the inventor the sole right of manufacture for the United States; and after numerous and costly trials, I devised in 1860 an improvement which I patented and under which all of these projectiles which were sold to the United States were made. They were exclusively used by the "Ricketts Battery" at Bull Run, and in very many cases did good service in the war, though not used in battle, as I believe one day earlier than the "Parrott projectile" which Major Dyer twice refers to as not having been made until some time after the breaking out of the rebellion. The "Parrott projectile" was tried early in 1861 - was sent to Washington and Fort Pickens in May of that year on the Order of the Ordnance Department - April 30th, and is the only projectile I have ever furnished for the 30 Pdr and larger calibers. They were tried at the Washington Arsenal when under your command in June 1861, and were in service at Bull Run. In regard to the reccommendation [sic] of the Board as to the projectiles to be used in the trial of the siege guns, I should not expect the Department to deny itself the privilege of trying a projectile so freely acceded to others, yet I should suppose in this case, as the gun is but a modification of the 41/2 inch given in the Ordnance Manual, that a projectile similar to that described therein for the same gun, was intended. But I have no further concern in this matter than to say that having noticed several instances in which attempts have been made by imitating more or less the construction of my projectile, to obtain some of the advantages which it has exhibited, I should doubt the justice of getting up a projectile by the aid of what I have already done, in order to deprive me of the fair reward of my labour and success. I might point to numerous instances of the successful use of my projectiles but it can hardly be necessary. 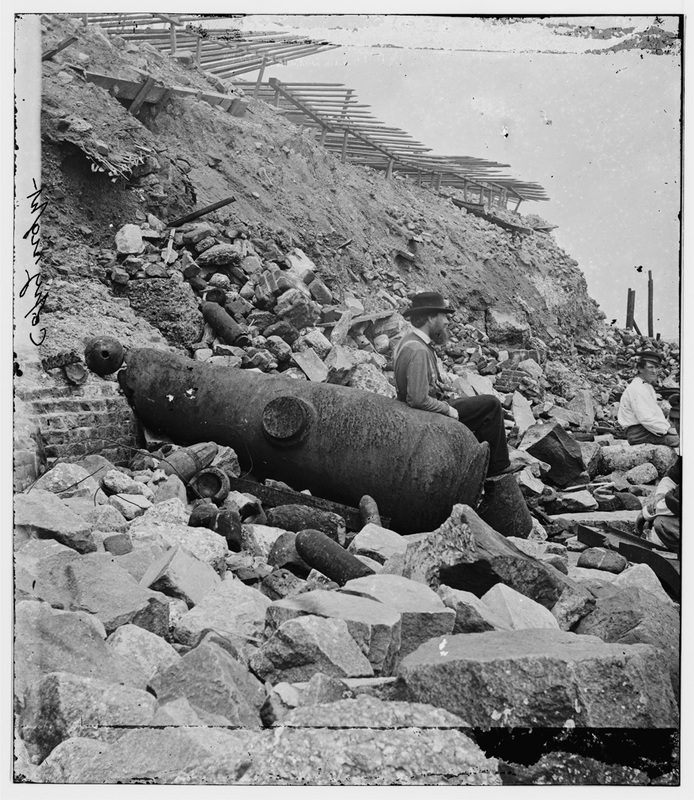 At Forts Macon & Pulaski, Yorktown and throughout the war they have been conspicuous; and I am entitled to say that the destructive bombardment of Fort [Sumter] is a feat unexampled in the history of Artillery. I freely admit that a progressive improvement is not only to be expected but is demanded in this, as in all other practical subjects, but I can not believe that it will best be attained by depriving me of the credit and encouragement which I think are justly my due. I had the honour to acknowledge, on the 23rd December last, your letter of the 18th of the same month with which you sent me a copy of Major Dyer's communication of the 19th of October 1863. I do not complain that I was not sooner made acquainted with Major Dyer's letter, or that it was published in the "Ordnance Memoranda", in all probability before I had seen it; for I have no doubt you will deem the request, which I now make, to give equal publicity to this letter, both just and reasonable. I should otherwise be prejudiced by my apparent silence, under remarks which Major Dyer desires may be sent to me, that I may have the opportunity to comment on them. While Major Dyer admits that I had a perfect right to make my projectile as I have done, he apparently thinks that I have no business to use an expanding material "cast on" the projectile; and that I was more particularly precluded therefrom by my having made many trials with the Read projectile, which has a cast iron body run upon an expanding piece of wrought-iron; in other words it seems to me that he maintains I ought not to have improved. I sent in my former letter a section of a cast iron shot for Rifled Cannon with a soft metal base or cup "cast on", made here about August 1856. Copper was also cast on at that time. If Major Dyer claims by being the first person who "proposed and reccommended [sic] to the Ordnance Department to make expanding projectiles for Rifled Cannon by casting a base or cup of soft metal on to the body of the projectile", to have invented or discovered that mode of making such projectiles, I think he is error. Mr. Sawyer's projectiles ordered from me by the Chief of Ordnance in 1858, and previously made by the inventor, though but partially expanding had soft metal cast on them. If Major Dyer claims to have first applied or proposed to apply the expanding principle in connection with the casting on of soft metal, I can refer to his own letter to me of Sept. 7th 1863, in which after stating that he had tried the "Read Projectile" at Fort Monroe in March 1856, he says "the result convinced me of the practicability of making an expanding projectile for Rifle Cannon. The expanding projectiles presented by Dr. Read were the first I had seen." Major Dyer there could not claim either the "casting on" or the "soft metal", or the application of the expanding principle, but made a projectile by combining the whole in his own way as others had a right to do in theirs. His result is an expanding projectile with a soft metal (not bronze) base cast on, and covering the base of the cast iron body, the soft metal projecting behind, and being hollowed out in the form of a cup to facilitate the expansion. The "Parrott projectile" has a ring or annular piece of expanding metal, much harder and stronger than the soft metal of the Dyer projectile, never adhering to the grooves or bore of the gun, and yet so arranged that without projecting at all beyond the body of the projectile, it is yet capable of expanding into the grooves on firing. It is exceedingly compact, and safe from injury by handling or exposure. In its exterior form it is, literally, cylindro-conoidal. It will not need any one "familiar with patents" to point out the difference between the Parrott and the Read projectile. I have always considered them quite dissimilar, and such was doubtless the opinion of the Patent Office as they readily granted a patent to me on application. My projectile was tried in the 30 Pdr. as early as April 1861, was in service at Bull Run, and is the only projectile I have ever supplied for my 30 Pdr. and large Rifle Guns. 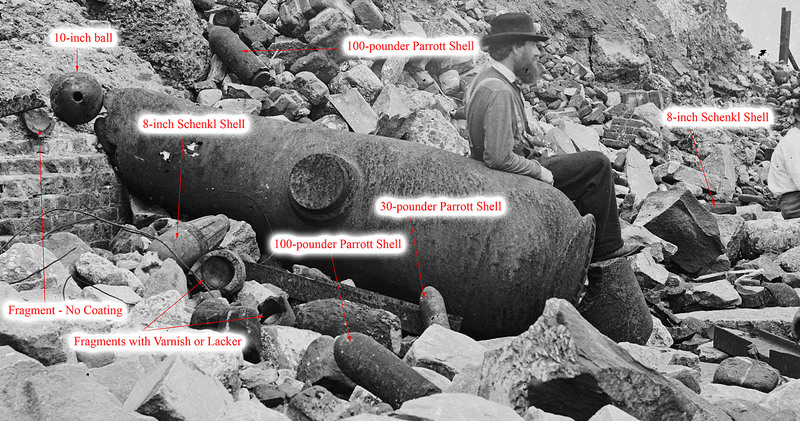 Whatever reputation my guns may have gained at Yorktown, Forts Macon & Pulaski and against Fort [Sumter], has been acquired with the "Parrott projectile". And I believe it is free from the objection, brought by Major Dyer against it, of not being ready until some time after the breaking out of the rebellion. 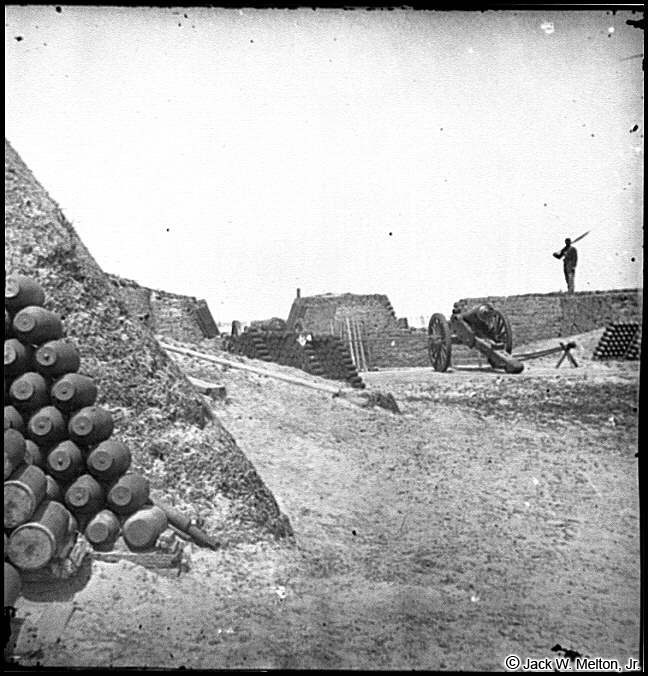 Major Dyer alludes to a 3 inch wrought-iron gun on which he put bands in 1859. If this is intended as an intimation that I obtained my ideas upon guns also from that eventful visit to Fort Monroe, I must declare that I have never been aware of it. I believe Commodore Stockton put bands on a 12 inch wrought-iron gun long before. During my stay at Old Point the only Dyer projectiles I recollect to have seen were fired, a few from a Bronze 6 Pdr Field Gun rifled, and a few from an Iron Rifle gun of my own of the same caliber. I do not think that Major Dyer considered the results satisfactory. I think it will appear from a neutral investigation of the facts that I cast on a projectile a soft metal, as well as a copper base long before Major Dyer did the same thing. He does not state that he ever used bronze as an expanding material for field or even for larger guns. The 32 Pdr projectiles alluded to in his letter as performing well, and those supplied for the 42 Pdr Rifled were made with the usual soft metal; lead being the chief ingredient. Real improvements in artillery are practical. The way has been open to all. If I have produced a gun or a projectile or a combination of both, the result of my own labour and study, I am entitled to claim as mine any peculiarities by which I have realised [sic] an advancement in the subject of Rifled Ordnance. I have not been eager to press such claims because generally admitted. My own name was given to both the guns and projectiles by the Ordnance Department, and by the Ordnance Bureau of the Navy, without any solicitation from me. But while I should deem it unjust to attempt to deprive me of such portions of my plans as constitute the improvements which I believe I have made, I am very far from objecting to any trials deemed advisable for the public service; and I could even appeal to the inventors themselves who have had projectiles tried, to which I might reasonably object, whether I have not freely given facilities for making any experiments or trials understood to be desired by the Department. BY Q. A. GILLMORE, MAJOR OF ENGINEERS, MAJOR-GENERAL OF VOLUNTEERS, AND COMMANDING GENERAL OF THE LAND FORCES ENGAGED. Published New York: D. Van Nostrand, 192 Broadway. 1865. "It would afford me great pleasure to introduce in my report of operations against the defences of Charleston, an explanation, from yourself, of the causes of the premature explosion of your shells, and the bursting of your large guns." I am at the same time informed that the space available for this explanation is very limited, while the time allowed is quite too short to prepare a suitable article even if there were room for it. I will, however, (since publications are to be made) let no occasion pass for disseminating what I deem to be the truth on the subjects alluded to by General Gillmore, and will first repeat portions of my statement to General Ramsay, then chief of ordnance, made January 11, 1864. "I am deeply sensible of the importance of the subject, and though I feel that we are not in possession of all the facts as they existed, I deem it proper to offer a few remarks, due as I think to myself, and possibly not without interest to the public service. First. 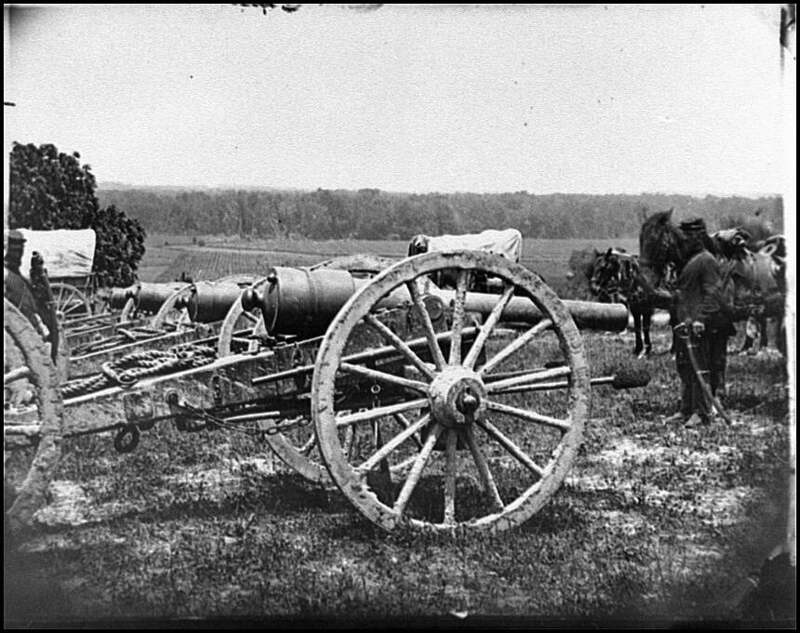 - I believe that when we consider the precautions which experience has proved to be proper in the use of rifle cannon; the effect of the premature explosion of shells, and the exposure of these guns to drifting sands, there will be little left to weigh against the evidence so generally given in favor of the safety of the guns themselves. "Second. - There are some singular discrepancies in the circumstances attending the failure of guns at Morris Island, which go far to prove the operation of causes of a peculiar and accidental character, rather than defects in the guns. 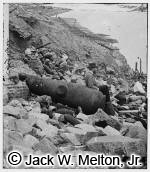 These are that the 100-pounders, by all known rules, the strongest of the three classes of heavy guns, and which endured so well at the first bombardment (one to 1,150 and another not failing at 1,450 rounds) should, at the second, have failed in several instances; the exposure to sand in the latter case being such as to make it proper to dispense with greasing the projectiles. "Again, the 300-pounders, which should have failed the soonest of the three calibres, were the system defective, have stood well. It is true the first was disabled by the bursting of a shell in the bore, but it sustained well the proper strain of the discharge; and the second, though known to have a defect in the bore, had endured 500 rounds, and must, from unofficial information have been used still further. And in regard to the 200-pounders I have before pointed out the facts connected with the service of two of these guns in the naval battery, which I understand to have been fired 660 rounds each, at the first bombardment, and kept for further use in other batteries. "Third. - The failure of guns from the blowing off the muzzle, or any part of the cast iron forward of the band, must be attributed to the premature explosion of shells, or the existence of obstructions in the bore, accidentally introduced therein, though the same cause may also have brought about the destruction of the guns in other parts, as by the blowing out of the breech, of which one case occurred where the shell was found wedged in the bore." The second 300-pounder alluded to was fired to 1,007 rounds. It then failed like the first by blowing off the muzzle. This gun was fired at the foundry 201 rounds, making a total of 1,208 rounds. My guns are strengthened in reference to the strains usually causing the bursting of guns not banded. When they give way they naturally do so in a peculiar manner. If lateral bursting is made very difficult, the blowing out of the breech does not prove that the banding is the cause, but merely that it transfers the bursting to another place where greater force is required to produce it, and thus truly strengthens the gun. In the small number of accidents which have happened with my guns in the naval service, not one has occurred from the blowing out of the breech. In no case is there evidence that a fracture has commenced directly in front of the band. In some, it is clear that the fracture, commencing much forward of the band, has been prevented by it, from extending and becoming dangerous. I believe that not one 200-pounder of 8-inch rifle, has burst in the naval service. Can a theory unfavorable to the guns be reconciled with so many discordant facts, or apply to one branch of the public service only? The fact of the premature explosion of rifle shells being beyond doubt, it was attributed, first, to their bad quality, and then to the fuzes; but not being prevented by all possible attention to these points, it became evident that the friction or attrition of the powder within the shell itself, was the true cause of most of the premature explosions. In proportion as care has been taken to cover the rough surface of the interior of shells with varnish or lacker, the explosions have diminished, until with a lacker of asphaltum, as now prepared here, applied to the interior of 450 loaded shells, not one has exploded prematurely. I reply that neither do my shells explode, with the charge of the spherical of the same calibre. The 10-inch spherical shell holds 3 1/4 pounds of powder, the 300-pounder or 10-inch rifle shell 16 pounds, and in the rifle shells generally, the charges are from three to four times greater than in the spherical of the same calibre. It was long the practice here in proving rifle guns, to use for the shells the following charges: 10-inch four pounds, 8-inch two pounds, 100-pounder (32-pounder calibre) one pound. These are very nearly the charges of the like spherical shells, and rarely, if ever, was there a premature explosion. These charges were deemed sufficient to test the soundness of the shells, action of fuzes, &c. But on filling up the rifle shells, numerous premature explosions took place, and led to the conclusion that the greater weight of powder in a long column did, by its increased reaction against the base of the shell, pressure, and consequent friction, cause the explosion. A conclusion manifestly sustained by the effect of coating the interior, already described. It may be added that though explosions have occurred most commonly within the bore, some are so far outside the gun as to make it probably that they are aided, if not produced, by friction due to the rotation of the shell. Doubtless these premature explosions of shells often occur without serious injury to the gun, but from the fact that the rifle shell is engaged in the grooves, as well as its large charge of powder, and possible jamming of the fragments, some, among numerous premature explosions, will probably lead to the destruction of the gun. Many important considerations in regard to the peculiar service of rifle cannon and the effect of sand with a close fitting, sliding projectile, would form a proper part of such an explanation as the importance of the subject would call for. At this time, however, I cannot extend my remarks. In conclusion I would say that I believe I have given the true explanation of the causes of the premature explosions of my shells, as well as the bursting of some of my large guns at Morris Island. In so new of a field of enterprise, accidents, not necessarily connected with rifled ordnance, but the result of want of experience, were to be expected. That my guns have encountered difficulties, (now as I think remedied) because so early in that field, so largely called for and used, cannot justly operate to their prejudice. West Point Foundry, Cold Spring, November 15, 1864.